I finished this quilt a couple of weeks ago but with all the stormy weather we’ve had I haven’t been outside to get pictures! The back is a Denyse Schmidt print from Joann’s. The binding is my favorite shade of teal Bella Solid (but I can’t remember the color name!). I quilted it with loopty loops and stuck it in the wash…it’s soft and crinkly and getting lots of use! So pretty! I love those shades of orange and aqua together — a nice transition from fall to winter. I'm having a Giveaway of 4 handcrafted Christmas soaps on now through Thursday only. Hope you'll stop in! That's beautiful Allison! 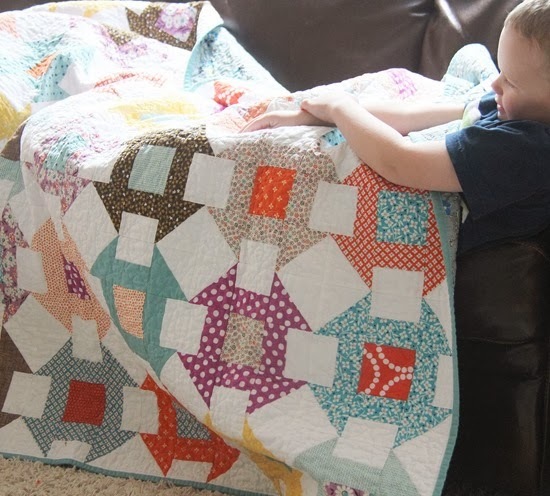 Were you able to quilt that large of a quilt on your standard sewing machine? It is fantastic! All those colors go so great together. What a beautiful quilt, the colors are so rich! One of my favorite blocks these days & yours is gorgeous! So pretty! 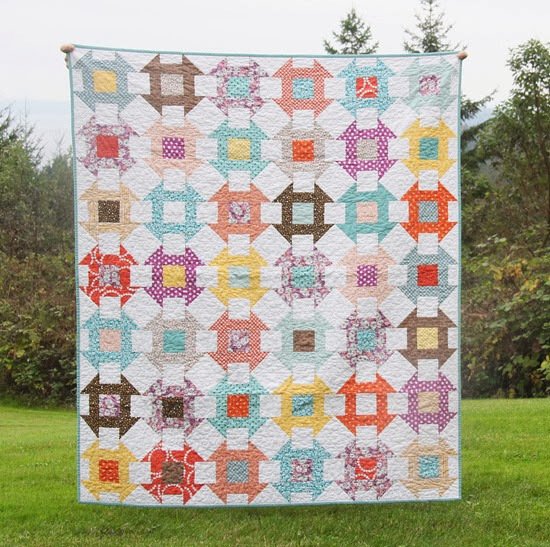 Churn dash is definitely a quilt I want to make at some point! your quilt is so pretty! I love its colors, and quilting too. Great job. Interesting colors! I love how you included purple and brown. It's a combo I've never seen before and it looks so pretty together! The Churn Dash is very pretty. What a gorgeous fall quilt!! I love the ladder in the background. Did you make that? You have inspired some quilt display ideas for me!! Love this quilt. Fabric suits the design. 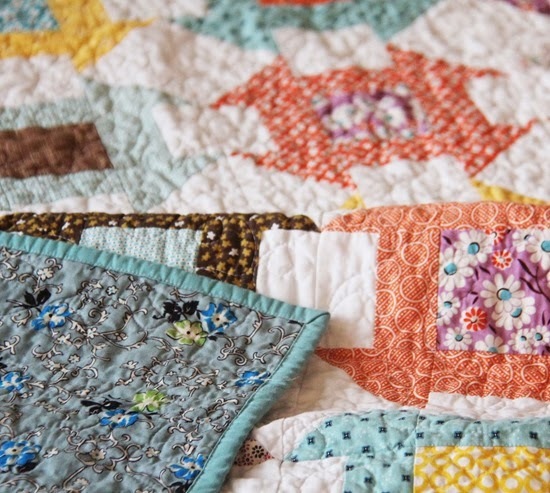 Your quilt is beautiful, and I love reading your blog! 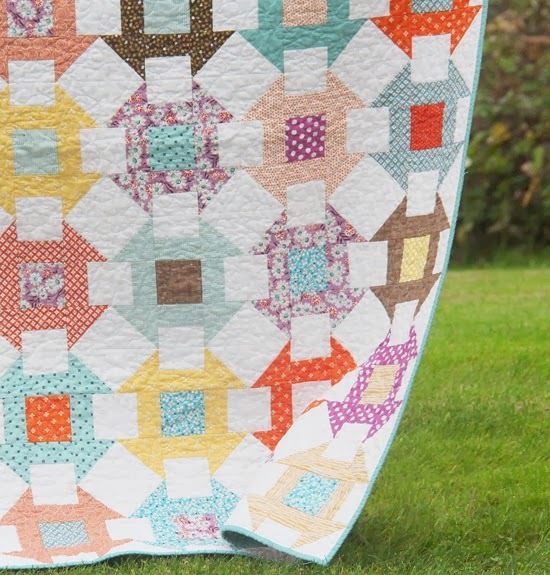 I love the colours you used and churn dash is on my list of quilts to make! I am in love with this quilt! It looks so cozy and fun. I've been wanting to make a churn dash for a while now. I love yours! All your fall quilts are making me want to make one. I love your Churn Dash, and the colors are wonderful! such a beautiful quilt. I love the Denyse Schmidt back fabric, do you know the name of it? So pretty. Love your color choices! I love churn dash quilts :) they are my favourite. Gorgeous quilt!! I love the colors! LOVED your Seville pattern so much so I ordered the PDF today!Can't wait to try it! Such gorgeous colors! I love how you used a contrast print in the centers, seems most churn dash quilts I see have the background fabric as the center. Amazing how a small change can make a big difference!! Another beautiful quilt Allison. I always love your color combinations. Is there another pattern in your future?? I really like the colors you chose – I am so afraid of using brown, but it looks great in there with those brights! Love the Denyse Schmidt fabric!! Well done! Lovely quilt! I love how it looks like the white blocks are on top of the color blocks, instead of the triangles I'm assuming they are. So lovely in these colours. When I first saw the churn dash block a couple of years ago, I wasn't very thrilled with it, now I'm completely converted and your quilt is one more example of how beautiful it can be. When I saw the first picture I didn't see the churn dash at all, it made me think of a large rolling block instead! Then I settled down. So pretty. I have been wanting to make a churn dash for a while. I just need to finish some other projects first.